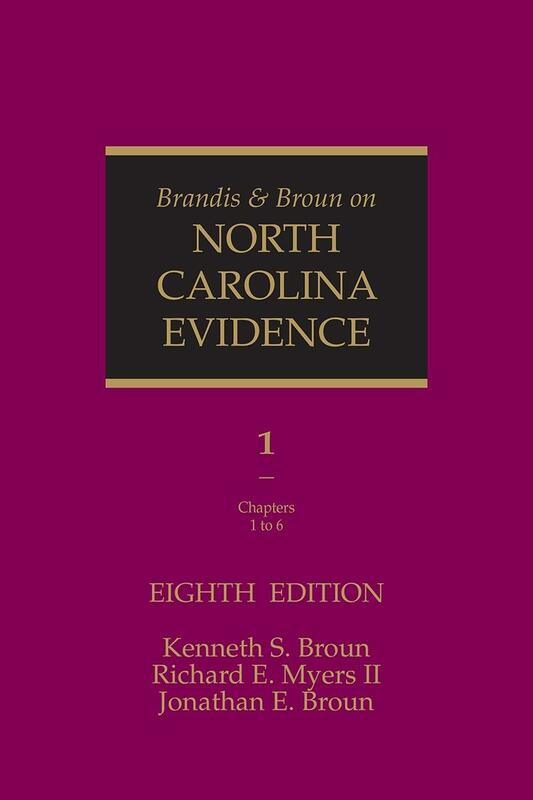 Brandis and Broun on North Carolina Evidence, the long recognized comprehensive and authoritative source on North Carolina evidence law, continues to be the working tool of North Carolina lawyers and judges. The Eighth Edition presents updated analysis of recent case law, statutory, and rules developments that affect the introduction of evidence in North Carolina courts. 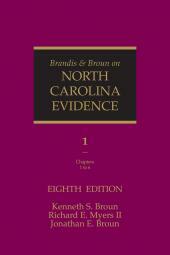 Brandis and Broun on North Carolina Evidence has long been recognized as both the comprehensive and authoritative, as well as practical source on North Carolina evidence law. The new Eighth Edition presents updated analysis of recent case law, statutory, and rules developments, most notably in relation to confrontation and scientific/technical evidence. Authors Kenneth S. Broun, Henry Brandis Emeritus Professor of Law at the University of North Carolina, Richard E. Myers II, Henry Brandis Distinguished Professor of Law at the University of North Carolina, and Jonathan E, Broun of North Carolina Prisoner Legal Services continue the tradition of authoritative and practical expertise that Brandis and Stansbury established over the past seven decades. 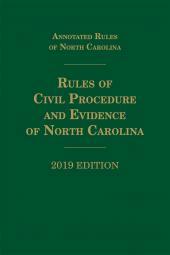 Following the organization of the Rules of Evidence, to make your research faster and more efficient, this two volume set provides commentary and analysis of all recent cases dealing with evidentiary rules and issues decided by the North Carolina Supreme Court and the North Carolina Court of Appeals. 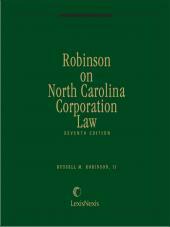 It also includes United States Supreme Court cases that affect North Carolina evidence law and references to pertinent law review articles. Kenneth S. Broun is the Henry Brandis Professor of Law Emeritus at the University of North Carolina at Chapel Hill School of Law. Professor Broun has been teaching at the University of North Carolina School of Law in some capacity since 1968 (visiting assistant professor of law at the University of North Carolina from 1968 to 1969; associate professor of law from 1969 to 1973; and professor of law from 1973 to 1989; Henry Brandis Professor of Law at the University of North Carolina School of Law since 1990). Professor Broun was admitted to practice in Illinois in 1963 and in North Carolina in 1976. Professor Broun was director of the National Institute for Trial Advocacy from 1976 to 1979. He served as dean of the University of North Carolina School of Law from 1979 to 1987; as counsel, Petree Stockton, Raleigh, North Carolina from 1988 to 1989; and as chairman, Board of Trustees, National Institute for Trial Advocacy in 1991. He was a member of the Federal Rules Advisory Committee from 1993 through 1999 and now serves as a consultant to that committee. He served on the NITA Board from 1980 through 2005. Professor Broun has been coordinator and faculty member, Trial Advocacy Training Programs, Black Lawyers Association of South Africa since 1986. In 2012, Broun was named an honorary bencher of the Middle Temple Inn of Court in London. Richard E. Myers, II is the Henry Brandis Distinguished Professor of Law at the University of North Carolina School of Law. Professor Myers brings a wealth of scholarly involvement as well as substantial practice experience as both a prosecutor and defense attorney. Professor Myers was a Chancellor’s Scholar at the UNC School of Law from which he was graduated with high honors in 1998. Following law school, Professor Myers clerked for the Hon. David Sentelle on the United States Court of Appeals for the D.C. Circuit, and then entered private practice as a litigator for O'Melveny & Myers, LLP, in Los Angeles California. After two years with the White Collar Criminal Law and Environmental and regulatory Compliance Practice Group, he left private practice in January 2002 to become an Assistant United States Attorney in the Central District of California. In 2002, he transferred to the Eastern District of North Carolina in Raleigh, where he prosecuted white collar and violent crimes, and headed the district's Violent Crimes Task Force for Wilmington and New Hanover and Pender Counties. Myers joined the UNC Law School faculty in July 2004. He teaches Criminal Law, Criminal Procedure, Ethics, and a seminar on White Collar Crime and has authored many law review articles dealing with evidence, criminal procedure and professional responsibility. Jonathan Broun also teaches trial advocacy at the University of North Carolina Law School and has taught in many training programs and seminars dealing with various aspects of advocacy, evidence and criminal procedure.